The tracking page said it would be here already! This entry was posted on February 1, 2015 by wp_admin. 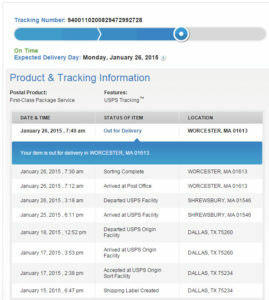 It is not common, but it does happen that the post office takes an unusually long time to deliver a package. I don't know what issue the post office experienced, but in this last week I have had about six customers ask where their package is. This is one of the first two tracking numbers reported to me. It took 11 days for the post office to deliver this package. It is one of the more extreme cases we have seen, and due to the number of folks reporting delay, we think perhaps there was an accident. This is frustrating for us and the customer alike. I don't want to ship a replacement, and then find out the package was delivered later the same day. But I don't want to make the customer wait any longer than necessary if the package is lost in the system. I want to take a moment to share what shipping information we have access to. When customers inquire as to where their package is, we turn to the USPS tracking page. We don't have access to any tracking information other than this tracking page. Another source of frustration for folks is the Post Office will list the Expected Delivery Date. That delivery date is not specific to your package. They did not study the logistics of getting your package from Point A to point B this week, and based on that give a delivery date. The post office has a customer service number. For me it is (972) 393-6755. If I call inquiring about a package, I will spend an hour on hold. When they answer, they will take the tracking number and initiate an 'Investigation' and they say to expect a reply two weeks later. On the phone, they don't have any different tracking information their their own website. So we don't generally call because we will have shipped a replacement by then. Although we ship tens of thousands of packages a year, we have no special access with the post office. The post office claims that first class and priority mail typically takes 2-3 days to arrive. In our experience, yes at least 51% of packages are delivered in 2-3 days. But 10%-20% arrive more like 6-7 days. And 0.1% arrive in 11 days. We don't generally call the post office for delayed packages because investigations take two weeks or more and the package will have arrived or we will have shipped a replacement by that point.